You can see the carrots, meat, other veggies in the picture, but they just had no texture OR taste! I realized that “no texture” was part of the bland taste. I remembered that once I started mixing it, the veggie & rice lost its shape, and the meat disappeared. I was talking to my friend and we came to the conclusion that it was as if they boiled all the ingredients in water for a very long time, got all the juice and flavor out, and used the water for some soup, and used the veggie for the bibimbap. Anyway, this is bibimbap make-over day 2. 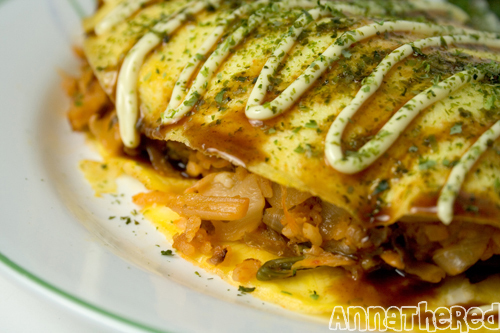 I decided to make an “omurice” with leftover bibimbap. 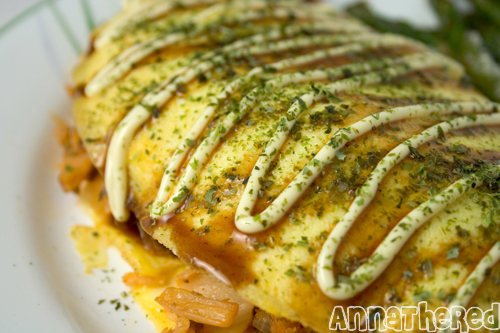 Omurice is a very popular meal for kids in Japan, and it’s basically fried rice (usually seasoned with ketchup) inside an omelet. The bibimbap rice was still a bit mushy and had no texture, so I cooked sliced onion in a frying pan. When the onion turned clear, I added the bibimbap, seasoned it with salt and pepper and a bit of ketchup, and I removed the rice from the pan. Then I beat 3 eggs, poured it on the pan. After cooking the egg for a couple of minutes, I put the bibimbap rice on one side of the egg, and flipped the other side of the egg onto the rice. 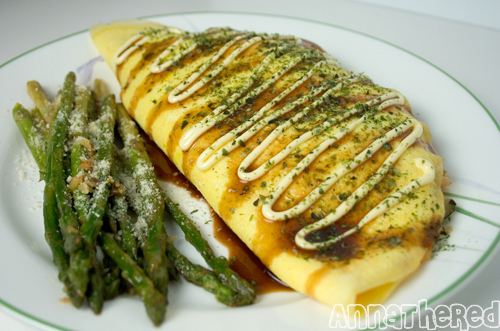 I put worcester sauce and mayonnaise on the top of the omelet, and sprinkled powdered seaweed on top.